Please refer to our stock # 2024 when inquiring. This doll is from a collection in Maine. She is stockinette that was originally early polished cotton and was recovered 50 t0 75 years ago. So she is all original just recovered. This is not that uncommon if the doll was valued it was repaired. Old black fabric dye had iron oxide that was corrosive and weaken fabric. It is why this face has some holes. Her face has beautiful embroidery, the nose has to be the fanciest I have ever seen. She has shoe button eyes and pieces of white linen tacked on for eye brows. She has even an earlier face under this one but it is risky to take the face off. Once it is off you can't put it back and have it look right. There is usually are reason that a dolls face is recovered. She is cotton stuffed medium firm. Her arms and legs are jointed. Her dress is not original but is early and appropriate and fits her nicely but is a little long. Her hair is a nubby fabric that looks great. She is a 20" and is circa 1870. 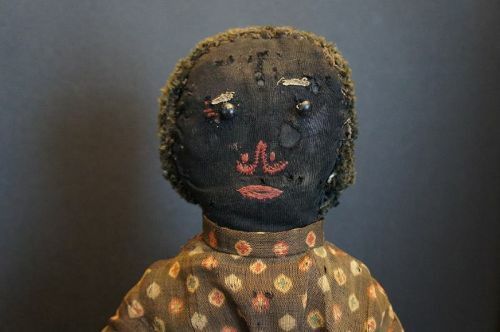 A great example of a early black cloth doll.